Ian Jones has taken on a new role at the EMC, as the Manufacturing Improvement Lead, working with and leading on improving productivity in Mod 1 and on future programmes. 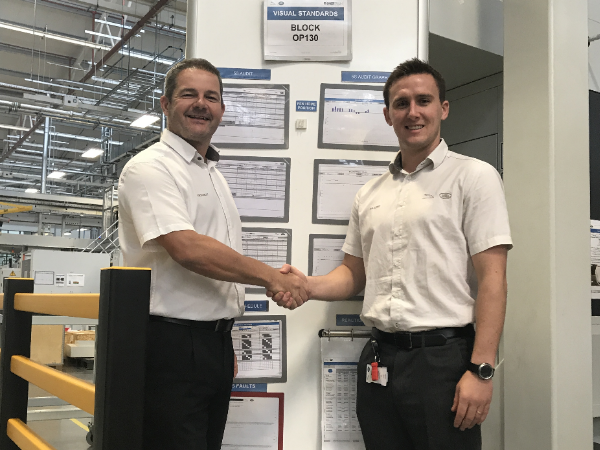 In his new role, Ian will focus on the machining areas of the EMC, concentrating on process improvement and governance responsible for all lines. He will support the maintenance teams in driving forward Continuous Improvement methodology. Manufacturing Manager Jon Stanley said: “I’d like to welcome Ian to his new role. He brings with him a wealth of knowledge and experience from our operations team, planning and organisation skills, all critical to this leadership role. Ian will liaise with the production and manufacturing teams to drive improvements forward, set new standards and ensure sustainability of new processes. He will also act as liaison with PTME and Launch teams to ensure lessons learnt are implemented in future programmes. A team of manufacturing improvement technician and the Kaizen Team will report to Ian and he will be responsible for the creation, monitoring and setting of targets within the wider Manufacturing Improvement Team.